January | 2013 | Science, I Choose You! A few weeks ago we ran a really awesome science show on the phenomenal science of fluids! I got inspired to write a little bit about fluids. In Wikipedia a fluid is defined as “a substance that continually deforms under an applied shear stress.” Translation? A fluid is something that takes the shape of its container. Think about pouring water from a mug to a fish bowl. The shape of the water changes to conform to the shape of the fish bowl. Now, for a water balloon, what shape does the water in the balloon take? (think about this for a few seconds…) Our outreach coop student Alice took the following slow-motion video of her popping a water balloon. Did you get it right? So the water actually took the shake of the balloon, suspended in the air for a little bit when the balloon broke, and then dropped down all over (Slow motion videos are so cool, I can watch this for the whole day). Although when we think of “fluids” we usually think of liquids (water, juice, coffee, and more coffee…), gases are also fluids. When we fill a container with a gas, it conforms to the shape of the container. Now, what happens when we pop a balloon that is fill with a gas? More specifically, what happens when we light a balloon filled with hydrogen gas on fire?! This happens really fast! Here is a video taken when my colleague Tamara from UBC Chemistry Outreach lit a balloon filled with hydrogen gas (highly flammable, don’t do this at home!). So fast that we actually cannot see what really happened without using a high-speed camera to take a slow-motion video. Here is a video about hydrogen-filled balloons from the Period Table of Videos (with additional explanation!). I rarely reblog something but this got me really excited! 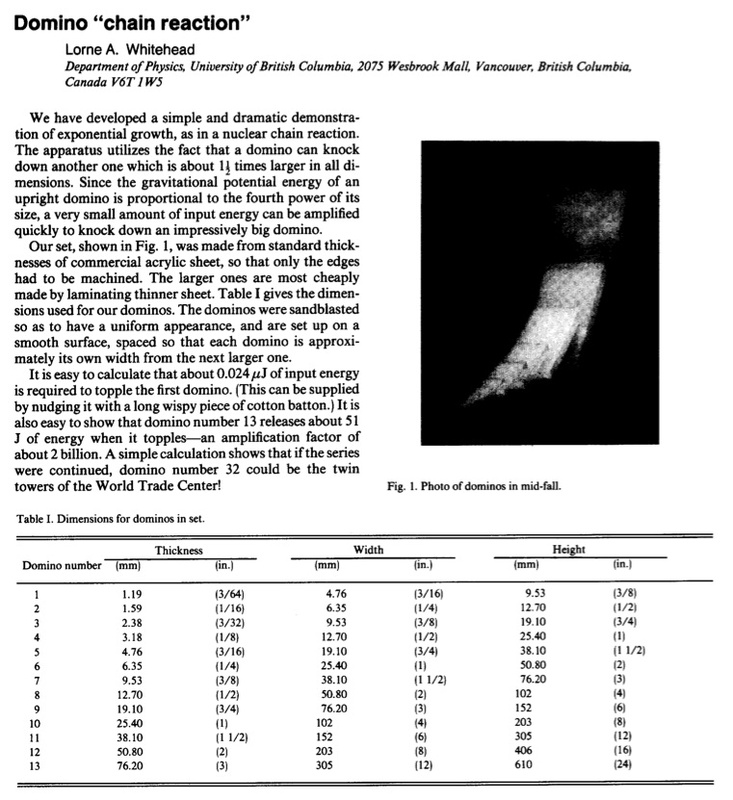 The original paper was written by Dr. Lorne Whitehead in my department. We actually have the exact demo built by him, and we used it in our science shows! I saw the demo a few times – usually we get a little kid to come up and blow the dominoes down. Pretty awesome. One of my favourites. Thanks Dave for sharing this on his blog! “A domino can knock over another domino about 1.5x larger than itself. A chain of dominos of increasing size makes a kind of mechanical chain reaction that starts with a tiny push and knocks down an impressively large domino. I currently have a scoop.it page where I curate online content from elsewhere. However, it is starting to get really difficult to maintain both my WordPress blog and my scoop.it page. In addition, WordPress provides better analytics for me to track where the traffic came from. So starting now I will only maintain my WordPress blog. This means that you will see more diverse posts covered here (links, photos, videos, etc). Regardless, the scope will continue to be about science outreach, communications, our society, and hopefully more fun stuff!